Featuring a player-driven economy and the flexibility of its “You Are What You Wear” class system, Albion Online delivers a unique MMO experience that shines a spotlight on the actions of its community. Borders fluctuate as guilds vie for land in an unending PvP struggle. Player-crafted goods and equipment populate the realm’s vendors. Enterprising individuals corner local markets with their own storefronts. Rangers can trade in their bows for axes as they collect lumber to fuel their guild’s war effort. Everyone - be they warriors, gatherers, crafters, merchants or bandits - matters in the forging of Albion Online’s rich and living history. So whether you’re ready to strike out with a group of likeminded adventurers or retreat to your own personal island home, the wilds of Albion are yours to explore and shape. Tell your story: Inhabit a persistent world where you decide what your legacy will be. Will you take up the mantle of a legendary warrior? What about a world-renowned armorsmith? Player-driven economy: From shopkeepers’ wares to every item that mobs drop, players craft the goods that keep Albion’s economic wheel spinning. Change the game. Go classless: Don’t feel burdened by your role. Embrace Albion’s “You Are What You Wear” system and shift your role with ease. 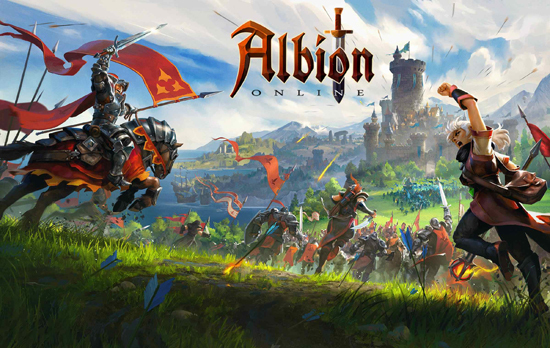 Represent your guild: Connect and coordinate with other players to expand your territory on an ever-shifting map as you take on rival guilds and shape Albion in your image. Be part of a community: Join over 250,000 dedicated players in the beta alone.